My brother Don and his wife Alice have been married over 30 years. They are a wonderful couple and I love them both so much. We have a great relationship and I’m so thankful to have them in my life! You know when you have family members over the years you develop a system and we have one that works really well. When they are at my house, I do the cooking and clean-up. When we are at theirs, Alice takes care of everything! I love her cooking and she makes so many wonderful meals. 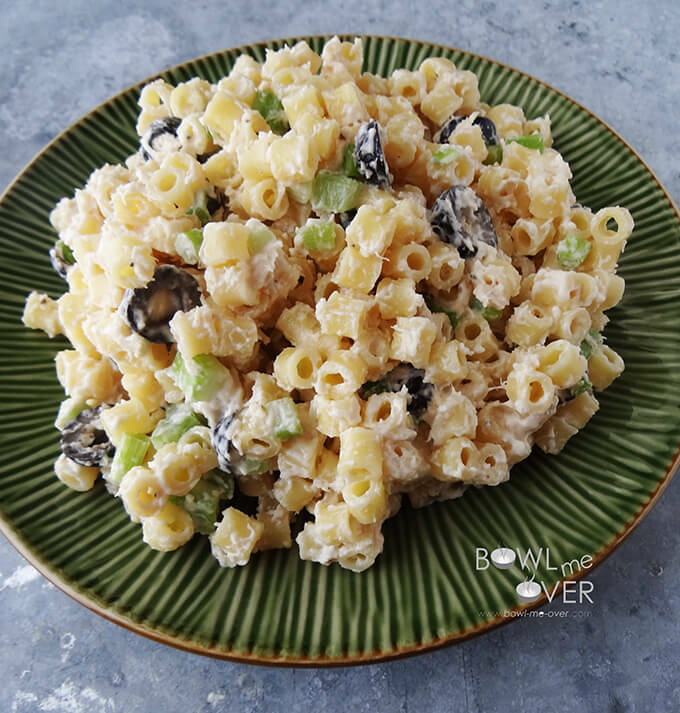 With Alice’s permission I’m sharing her recipe for Tuna Pasta Salad – it’s my favorite salad she makes; creamy, crunchy, salty and savory – it checks off all the bases!. Easy to make and tastes even better the next day. Are you bbq’ing this weekend? This salad would be perfect to compliment grilled pork, steak or chicken. You should definitely give this yummy salad a try! If you are adding more tuna to your diet this Tuna Pasta Salad Recipe should be on your list. This salad is the perfect to compliment grilled pork, steak or chicken. Terrific as a light lunch! Put a pot of water on to boil - generously salt the water. When boiling add the pasta and cook to al dente. When the timer's up, drain and rinse with cold water. Sprinkle with a teaspoon of olive oil & a teaspoon of seasoning salt (I use McCormick's). Set aside to cool. Slice the olives, dice the celery into a small dice and thinly slice the green onions. Drain the tuna and flake it well. Add the olives, celery, green onions and tuna to the pasta. Also add the grated parmesan cheese, 1/2 teaspoon salt & 1/2 teaspoon pepper. Mix to combine. Add the mayonnaise & miracle whip - equal amounts of each. Depending on how warm the pasta is you may need to add additional mayo & miracle whip - just eyeball it. You want this to be nicely creamy. Tuck it in the fridge when you're done - stir well before serving, add additional mayo/miracle whip if needed. I have eaten this salad many time and it is very good. Thank you both. Alice for making the Salad first and Deb for publishing it. Looks fantastic! Can you substitute the tuna for chicken? I don’t know why you couldn’t – probably just use one rotisserie chicken breast. You may need a bit more salt – give that a try & let me know if you like it! Holy yum this looks incredible, awesome photo! I think I may substitute chicken for tuna… this looks great! I hope you give it a try Lizzy – if you do the switch-a-roo, let me know what you think! Tuna noodles used to be one of my favorite dishes as a little girl! Me too and I love it as a salad. This looks absolutely delicious! I am definitely saving this one for later! Awesome, let me know what you think Marye. I love the crunch you added with the celery and salty olives. Definitely makes the salad Christie – thanks for stopping by! What a great salad for all of the end of summer BBQs coming up! I am loving the idea of the parmesan and olives, has anyone ever added capers? I wonder if they would give a nice briny kick too. I have not tried capers Des, I think it would be a great addition to this salad! 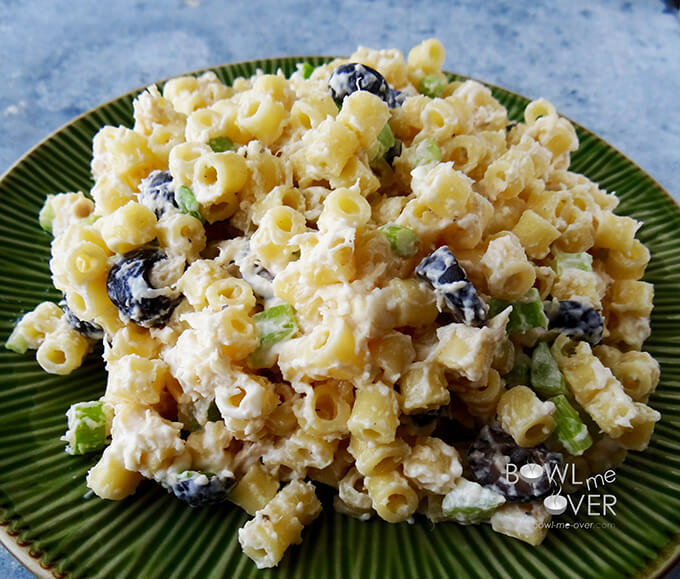 Tuna pasta salad is an old favorite – now I’m craving it! I love the addition of olives, it’s making me think capers would be good, too. Yes, I think you’re right – it’s that salty bite that adds so much! Awesome, let me know what you think Theresa! Oh yes, an oldie but a goodie, thanks Gwen! I love family recipes – it’s so nice Alice was happy to share. I really like the addition of the olives and the parmesan to this yummy salad. What a lovely recipe! Sharing. Thank you for being a part of the Hearth and Soul hop. It’s such a blessing to have family that is enjoyable to be around, and to have those close relationships! Looks like a delicious pasta salad! Thanks Jamie – so true on all accounts! Thanks so much for stopping by! I love tuna salad and I love pasta salads, together they sound wonderful, thank-you to your sister-in-law for the great recipe! With Labor Day coming up this would make a great addition to the potluck/BBQ menu! Wonderful – I hope you & your family enjoy it Sandi! 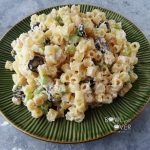 delicious pasta salad thanks for sharing with Hearth and soul blog hop, pinning and tweeting. Thank you so much! I always enjoying your party!!! Wow, seeing this brings back some foodie memories with my grandmother. She made a similar, but not exact dish…YUM. Salad looks great. I noticed that the ingredients are very very similar to our Family Tuna Pasta Salad.. I am going to pass ours and I will also make a batch of your Tuna Salad and compare. Out secret ingredient is Good Seasons Italian salad dressing. no substitutiones on the GSISDressing – a must have ingredient. (White Albicore works best for our family. Directions are the same as yours. This salad is even better stored in the Refrigerator Over night. Looking forward to receiving your weekly Recipes. Like you site – Simple and to the point and very easy to read. Ooh I LOVE your salad Tom that sounds absolutely delicious and I will definitely give it a try! The combo for the dressing sounds terrific and I will be sure to be on the look out for the Good Seasons Italian Dressing!